Buoyancy compensator devices & Wings from Scubapro, essential parts of your scuba diving equipment. Used to provide much needed emergency buoyancy underwater & also on the surface. Adjustable options to control overall buoyancy. This BCD also includes secure quick release integrated weights. 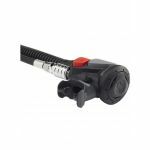 The trim weight pockets are included on the rear which hold any trim weight either side of your cylinder for a better position in the water. 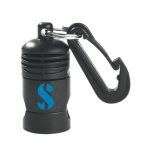 There is side pockets has a D-Ring and an octo holder to hold your alternate air source by tucking the hose or with a clip. The Scubapro X-Force also features anti-slip shoulder material which holds the BCD in position even when wet so the X-Force won’t twist or move. The interior is made from 420 Nylon nd the exterior is made from high resistance 500D Cordura for amazing durability, making this a high quality BCD which is long lasting and durable. The Cordura material also maintains the colour of the BCD even win various water conditions. Wrap Around Bladder - The Pre-formed wrap around bladder which provides excellent comfort and ergonomic fit. This feature makes the X-Force a great BCD for those who want a well fitted comfortable piece of equipment. High Buoyancy - The X-Force has high buoyancy thanks to the new gusset in the lower area of the air cell. Buckle Weight Evolution - The fixed male buckle in red is easier to locate, more streamlined and allows for one handed operation. This makes this BCD great due to how much easier the buckle weight is to use. Easy To Pack - This BCD is not only comfortable but it is easy to pack. Making this a perfect BCD to pack in to a suitable bag and go diving where ever you desire. This easy to pack BCD is for any divers who like to travel around with their own equipment. Weight Pocket - The X-Force is compatible with current weight pocket. The weight pockets allow you to add weights to either side of the BCD. Backpack With Air Net Padding - The soft air net padding on the backpack makes this BCD comfortable and gives a snug fit. Along with the padded wrap around bladder this feature makes this BCD one of the most comfortable BCD out there. Air Net Neck Soft Padding - The soft neck provides protection with Air-Net padding for increased comfort and protection. Octopus Holder - One each side of the X-Force BCD there is octopus pockets which give you the option of carrying a backup second stage. The octopus pockets also let you fold octo hose into the pocket creating a quick release option. Anti-slip Material - On the shoulder pads and straps covered in anti-slip material. The anti-slip material holds the BCD in position even when wet so the X-Force won’t move or twist. Strong Material - The X-Force BCD is constructed from Cordura 500 on the outside and 420 denier nylon on the inside. Together these materials make this BCD more durable and strong than ever, making it more resistance to aggressive dives and makes this BCD long lasting. D-Rings - The X-Force BCD includes six anodized aluminium D-rings which provide divers with convenient clip-on points for additional gear. 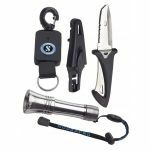 Plastic Grommets - This BCD includes a plastic grommets for knife attachment which is located on the left pocket. Weight - The X-Force is a medium weight BCD which weighs 4.3kg. This is BCD is still suitable for travelling and is easy to pack. Who is Scubapro X-Force BCD for? The Scubapro X-Force BCD is for divers looking for a very comfortable high standard BCD which is easy to pack. The X-Force BCD is a high performance piece of equipment which is one of Scubapro’s best. Thanks to the high quality material this BCD is long lasting and durable with more resistance from various environments. The X-Force is perfect for divers who travel around with their own equipment and want a easy to pack BCD which can be used in many different water environments.